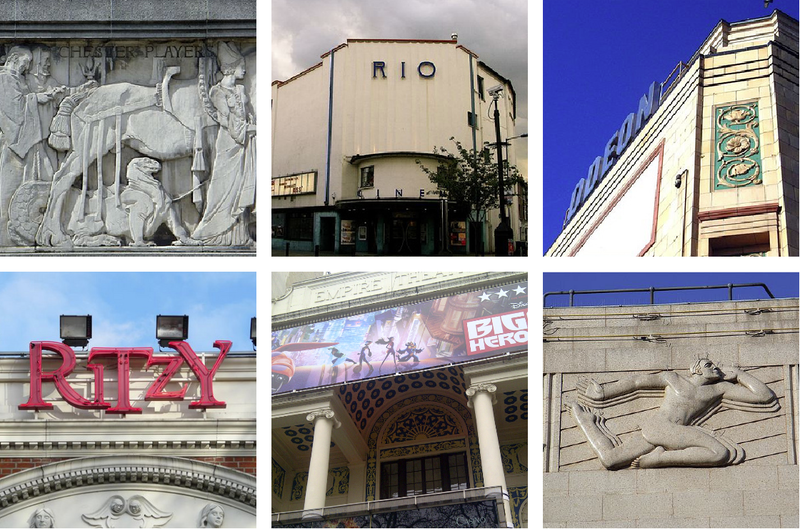 Jane's London: Why is the UK still knocking down historic cinemas? That's the heading on this article from BBC News. Of the London cinemas that remain but are no longer used for their orginal purpose many have been gutted and used for other things. The only ones that seem to have retained their interiors are now being used as churches or pubs. Many others are now converted into shops or other businesses and oly hints of their once sparkling past can be seen on the street-facing façades. Seeing as everything these days, films, music, etc., is available as downloads, or on demand, for how long will the few magnificent palaces that remain, some of which I show below, still stand? 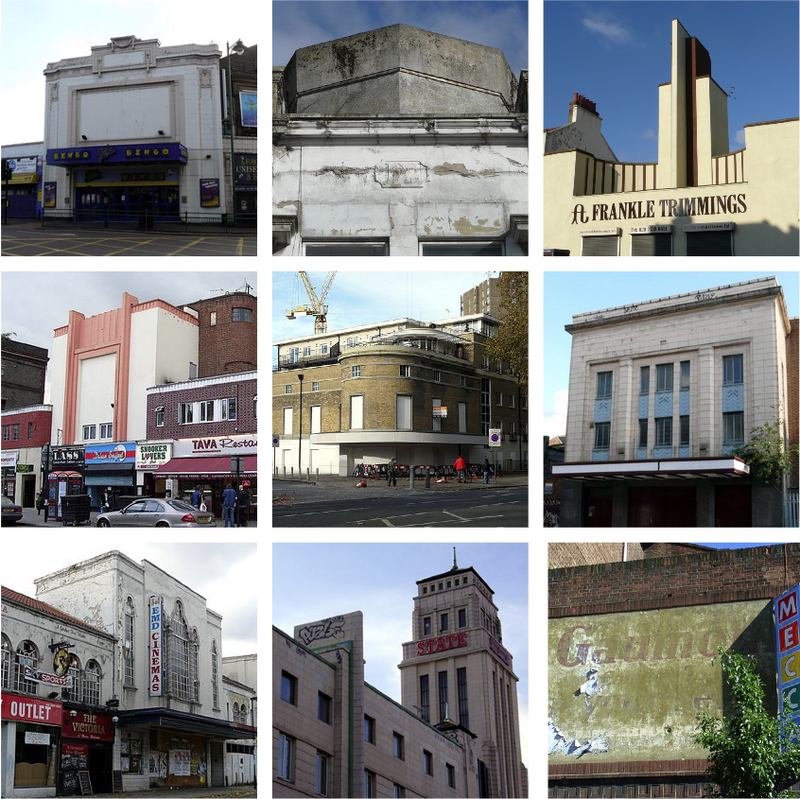 My two favourite cinemas used to sit adjacent to each other in Camden. The Parkway was a lovely old Art Deco cinema with a red dralon seats and just two screens. I particularly recall seeing Oliver Stone's JFK on the big screen there in 1991 whilst munching on a box of Maltesers. The small above the ticket office showed independent films and there was a piano on the first floor next to the confectionery and drinks counter and very often someone was tinkling the ivories before the film began. I am pretty sure that I read that John Boorman used the cinema when filming parts of Hope and Glory. There is a great scene when the lad who is the lead in the film can be seen leaning forward in the first row of the circle transfixed by the film he is watching. 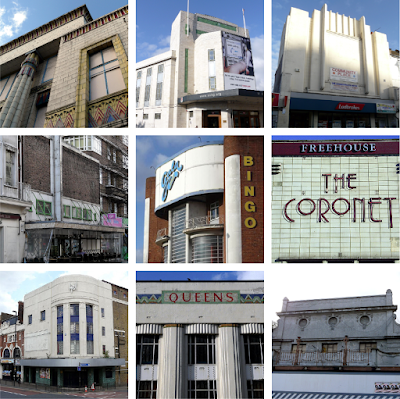 The cinema was gutted and modernised just prior to the last offensive about saving our old cinemas. Really bad timing and such a sad loss. The Camden Plaza around the corner, opposite the tube station, showed art house films and was simpler inside, but I recall the small entrance lobby/ticket hall was wood panelled, almost Tudor in design. At one point the cinema formed part of the Gaumont chain (later Odeon) and a pic of the faded sign on the side of the building is shown below. It's just occurred to me that many long gone cinemas gave their names to the junction on which they sat* as in the case of The Savoy Cinema in Acton (Savoy Circus). I used to drive past it often in the late 1990s and I just took it for granted. 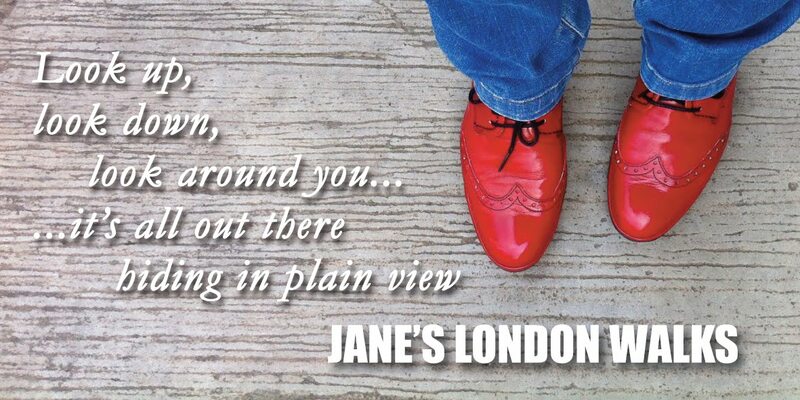 Then hoardings went up around it and very soon there was a big empty space. It stood empty like a barren wasteland for years. Below are some comparison pics. Amazingly I cannot find any older pics than these from 1971. 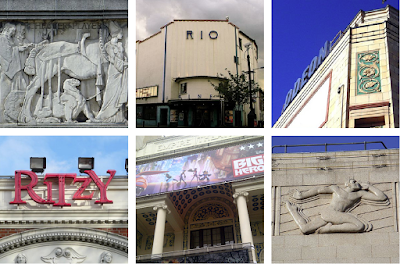 Lots of great pics and info about demolished London cinemas can be found here – click the tabs under the map to see other categories. 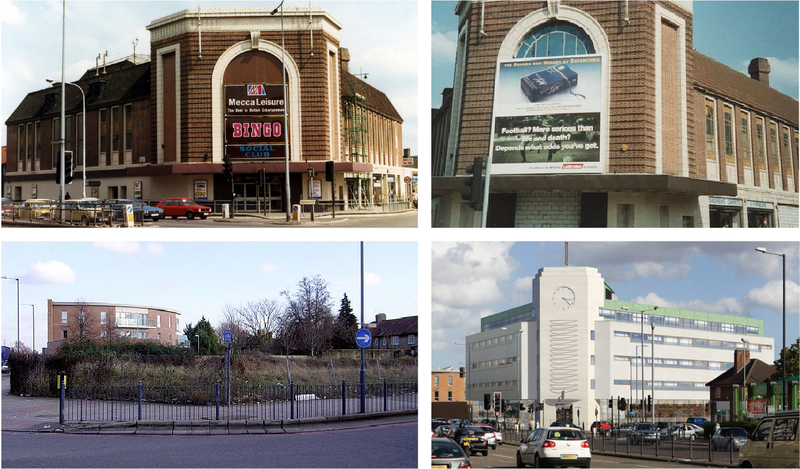 *I have often wondered whether there was a cinema called The Apex at Apex Corner. I have so far drawn a blank about where this name come from. Or possibly there was a shop? Whatever it was, it's now long gone. 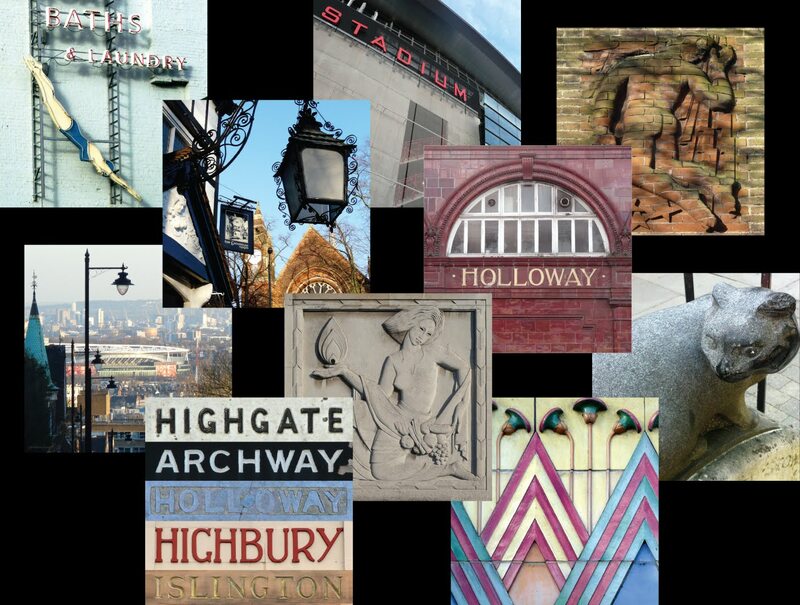 Londonist wrote a piece about the naming of road junctions a while back... does anyone out there have any more info?